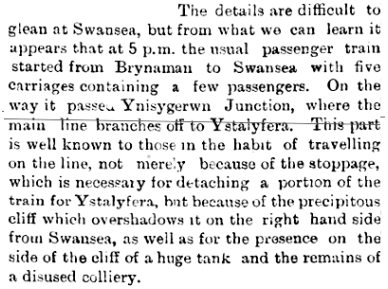 A few days ago, while skimming through one of my books on the history of the railways in South Wales (Miles & Watkins, 2004), I came across the following extract describing a junction line linking the Neath and Brecon Railway to the Swansea Vale Railway near Ystalyfera in the Swansea Valley. About a mile north of Ynysygeinon Sidings was Ynysygeinon Junction where the N&B line to Coelbren Junction and Brecon climbed to the east whilst the Swansea Vale Railway turned towards the west across the flood plain of the Tawe towards Ystalyfera. As I had lived in Ystalyfera for almost thirty years, my curiosity was aroused, so I studied some old maps to see the junction line in a geographical context. Above: The main map (adapted from Mitchell & Smith, 2004) shows the route of the Neath & Brecon Railway and the junction line linking the N&BR (at Coelbren) to the Swansea Vale Railway – later Midland Railway – at Ynys-y-geinon Junction. 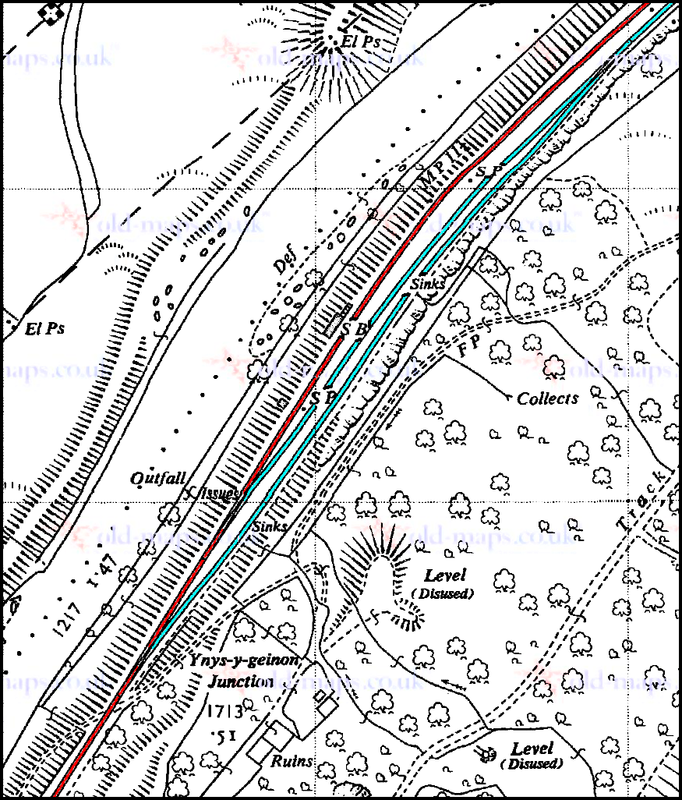 Inset is part of a large-scale Ordnance Survey map (published 1918) showing the tracks through Ynys-y-geinon Junction running alongside the river Tawe. 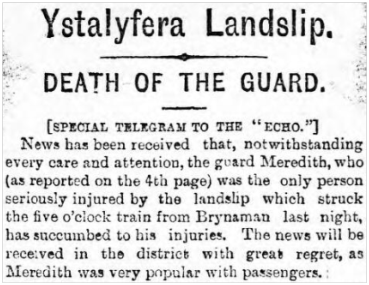 Over the years the area experienced several landslides, including a notable one in 1893 when a landslide hit a Brynaman to Swansea train, throwing the last two carriages off the rails. The guard, who was riding in the brake compartment, was killed by heavy luggage falling on top of him. 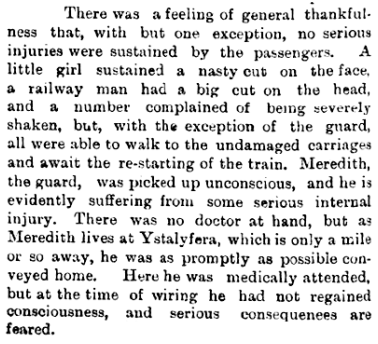 The description of the incident stirred my memory: I recalled that about twenty years ago I had corresponded with a genealogy friend in Florida, USA about a similar fatal railway accident involving someone named Meredith. A search through old correspondence soon revealed further details. The friend living in Florida was originally from Radnorshire in Wales. 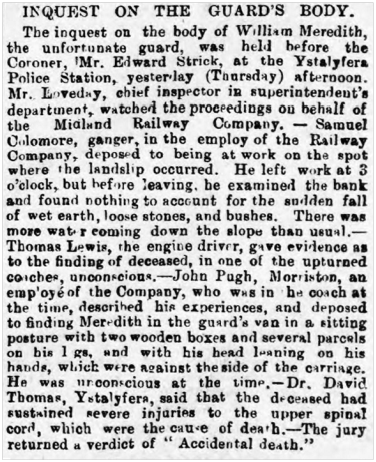 His family had connections with the Swansea valley, and in 1998 he had sent me a newspaper cutting dating from December 1893 describing a railway accident that had taken place near Ystalyfera in which the railway guard was seriously injured. I resolved to find out more. 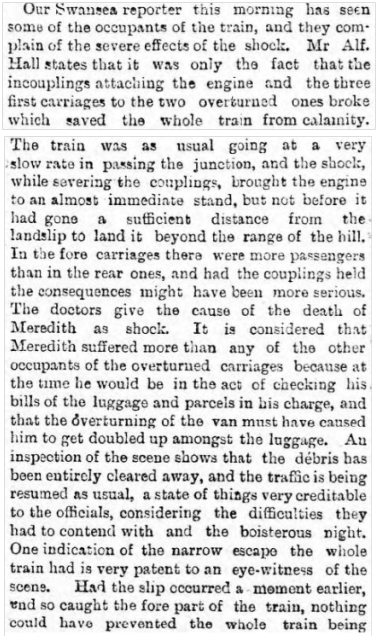 A report in the South Wales Daily News revealed that on the evening of Tuesday 13 December 1893, after heavy rains, a landslip at Ynisgerwn (Ynys-y-geinon) Junction had caused the last two coaches of the 5:25 pm train from Ystalyfera to Swansea to be ‘thrown off the rails’…. Apparently, the passengers in the front part of the train were unharmed. They climbed down to investigate and see if they could help those who had been in the two rear coaches. 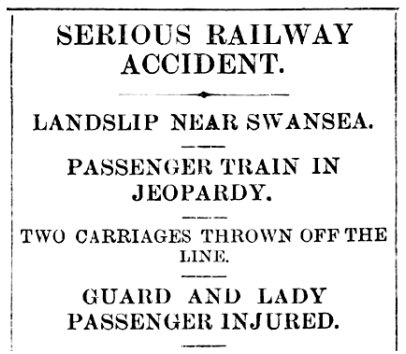 The fourth carriage had merely been derailed and its passengers were easily helped out. The other carriage was lying on its side with its occupants thrown on top of each other. With the help of the able passengers they escaped to safety through the windows on the up-turned side. The report went on to give further details of the mechanism of the accident. 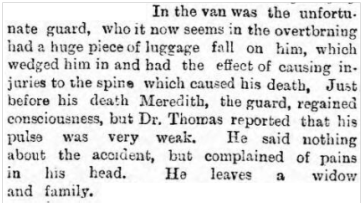 So poor 38-year-old William Meredith died of ‘upper spinal cord injuries’, in layman’s terms a broken neck, as a result of heavy luggage falling on him when the guard’s van rolled over. I wanted to find out more about William and his family. I began by searching the National Probate Index and discovered that in the absence of a will, letters of administration had been probated at Carmarthen in 1894, the year after William’s death. Entry for William Meredith in the National Probate Index. The Probate index entry showed that William’s effects (£381 18s 3d) were bequeathed to Margaret, his wife. The Meredith household, as recorded in the 1891 Census. Ten years earlier (1881), the Merediths had been living at 10 Alltygrug, Ystalyfera, with their daughter Lizzie, then named Eliza A Meredith. The General Register Office’s marriage index showed that William had married Margaret Williams in 1876. The Meredith household in 1901, showing widow Margaret Meredith and four of her children. The Neath & Brecon Railway’s junction line from Coelbren via Ystradgynlais had to drop from a higher level in order to join the Swansea Vale (later Midland) line from Brynaman at Ynys-y-geinon Junction. This Ordnance Survey map published in 1961 shows the former Swansea Vale (Midland) line (red) being joined by the former Neath & Brecon junction line (pale blue) at Ynys-y-geinon Junction. The train approaches Ynys-y-geinon Junction from Coelbren. The track on the right is the Midland Railways line from Brynaman and Ystalyfera. The River Tawe is hidden by the trees on the right. The 1893 landslip occurred a few hundred yards further south (photo by H.C. Casserley in Jones, Dunstone and Watkins, 2005). 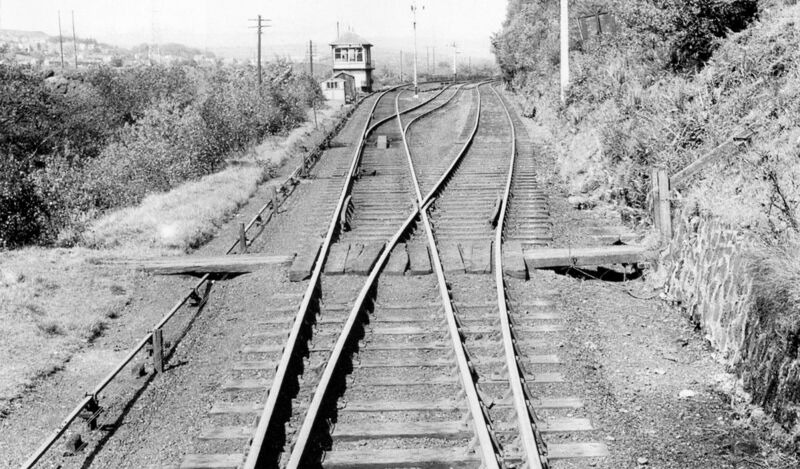 This view of Ynys-y-geinon Junction from the south shows the two N&B tracks going off to the right. As the OS map shows, they merged into a single line immediately north of the junction. The line to the left is the SVR (Midland Railways) main line from Ystalyfera and Brynaman. The signal box, is a 1910 replacement of the original box (photo from Miles and Watkins, 2004). 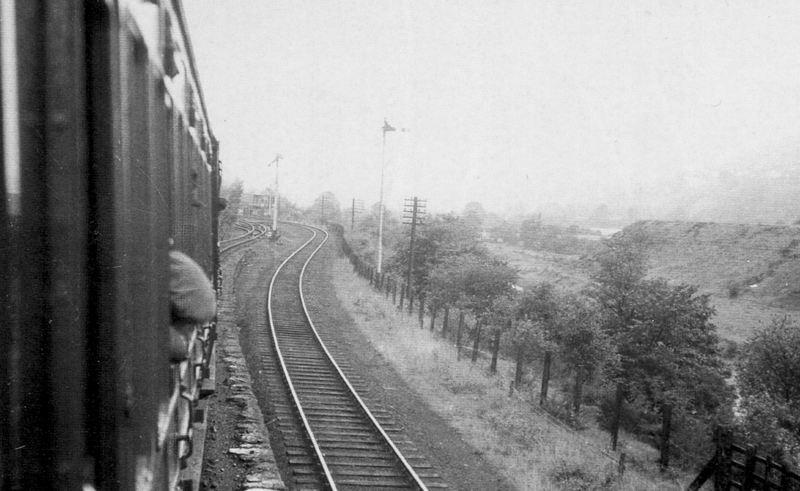 At various times some of the Brecon and Brynaman passenger trains were joined and divided at Ynys-y-geinon Junction. The 1882 working timetable shows that for Up trains just three minutes was typically allowed for this procedure. Five minutes was allowed for Down trains. The trackbed of the former Midland Railway line at Ynys-y-geinon Junction is now a cycle path and public bridleway. The photo below, taken after heavy rains in January 2008, looks northwards along the recently surfaced path. 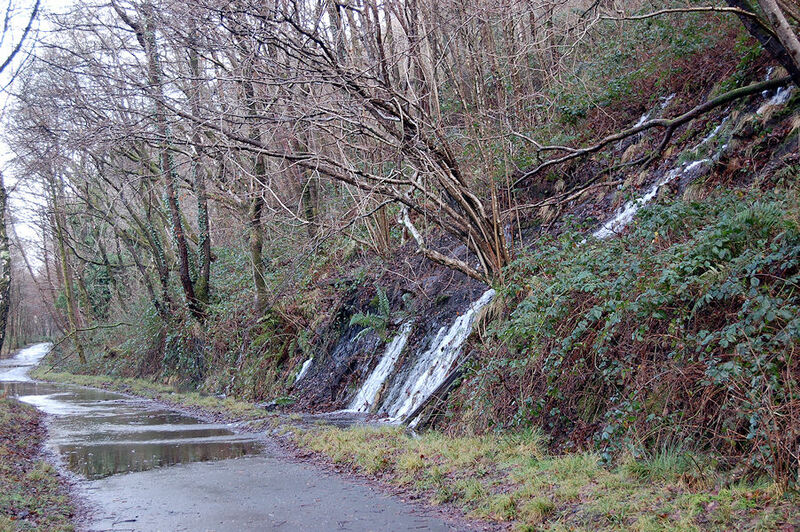 The weather conditions in 2008 were similar to what they had been on 13 December 1893, with surface water tumbling down the hillside and flowing over what was then the railway track. 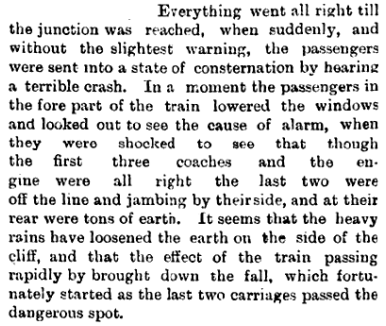 It is easy to imagine tons of earth from higher up the hillside crashing down onto the track and derailing the train. (Photo by John Ball, 15 January 2008). 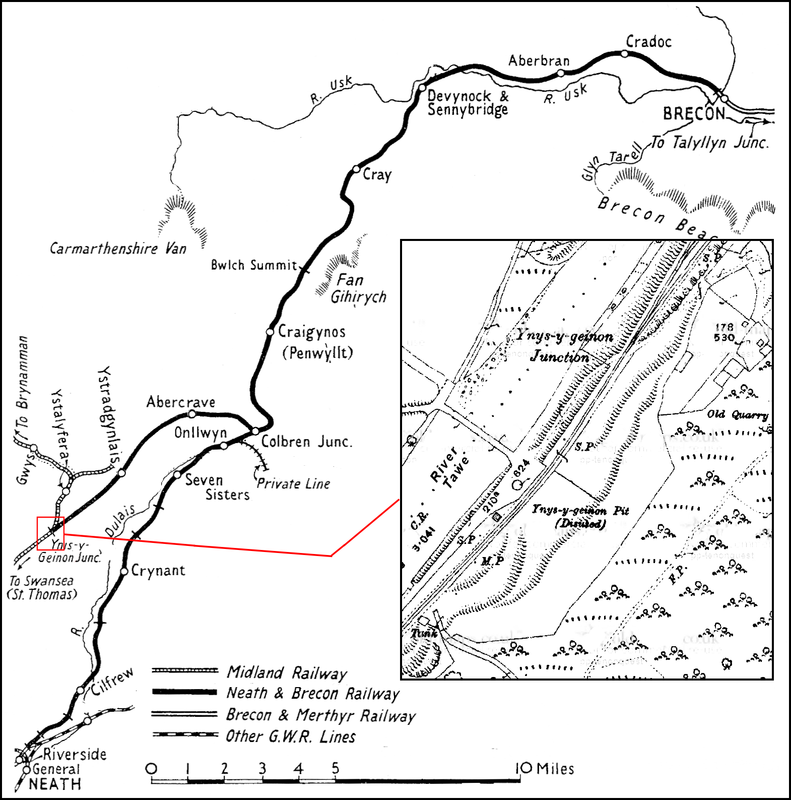 By the end of the 1960s the former Swansea Vale / Midland Railway line to Brynaman and Ystalyfera, and the Neath & Brecon Railway (latterly Great Western Railway) had closed, thus ending the railway services in the Upper Swansea Valley. However, the railways left a permanent mark on the landscape. It is still possible to find evidence of the track-beds, buildings, and line-side features that have survived from the railway era. Jones, Gwyn Briwnant, Dunstone, Denis, and Watkins, Tudor (2005) The Neath and Brecon Railway: A History, Gomer Press, Llandysul. Miles, John, and Watkins, Tudor (2004) Midland Railway: Swansea Vale & Branches, The Welsh Railways Research Circle, Bassaleg. Mitchell, Vic and Smith, Keith (2004) Brecon to Neath: including Ystradgynlais, Middleton Press, Midhurst. Ancestry.co.uk – Census and National Probate Index images.